Kydoni (quince) is known from ancient years and its cultivation is said to have preceded that of the apple culture. Many references to «apples», in the ancient years may have been to a quince. Quinces have a coarse texture, are too hard, astringent and sour to eat raw. They also oxidize, like apples do, so you have to keep them in water with lemon juice. When cooked they soften and change colour from creamy white to pink-dark orange and near to ruby-red whilst they release all their sweet aroma and delicate flavour. According to Harold McGee in On Food and Cooking, quinces contain compounds called anthoxanthins and anthrocyanins that behave in a way that is the opposite of chlorophyll: they are water-soluble and change color, as when red cabbage can turn blue when cooked or blueberries turn green in a pancake. You can omit the chestnuts if you like but as they are both autumn fruit, they can well be combined. Quince is one of my favourite spoon sweets and I made it three times this year. The first and second time I made it the same way as I had previously posted the recipe and my children loved it. My son who was coming from Switzerland for the Christmas holidays told me that he wanted some to take with him so the third time I was making it, it coincided when I had bought a lot of chestnuts so I decided to combine them together. To make the preserve, the quince is peeled and cut into slices and are cooked until they become soft. We reserve some of the water the quince was boiled and we cut the quince into thinner slices. We then add the sugar and the reserved water. Meantime, we also boil and peel the chestnuts. When the sugar melts, we add the fragrant geranium leaves, the spices and the chestnuts and cook them together until the syrup sets. See detailed instructions here. I like flavouring the preserve with fragrant geranium leaves but if you do not have any, you can add some vanilla. 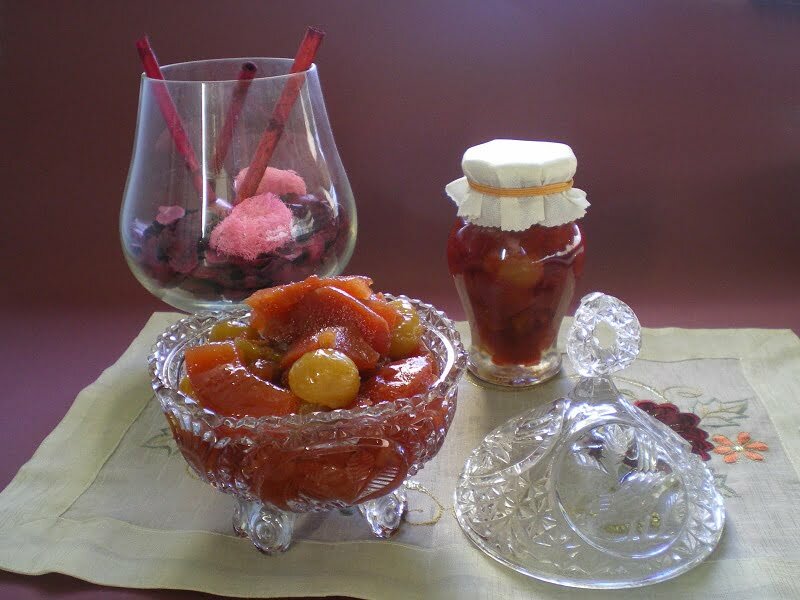 Glyko Kydoni (quince preserve) is great over Greek yogourt, puddings or ice cream and also make terrific homemade gifts. Score chestnuts with a sharp knife and boil for 20 minutes. Strain them, add cold water and peel them. Prepare a big bowl with water and lemon juice. Cut the quinces, peel and remove core and put them immediately, in the water. Before starting the preserve drain and weigh the fruit and use equal amount of sugar. In a pot add the 5 cups of water and start cutting the quince into thinner slices of 1 cm (0.40”) thick and put them directly in the pot. Bring them to boil and then simmer with lid on for 20 – 30 minutes until they are soft. When they have boiled, drain keeping 1 cup of the boiled water. Put them back in the pot in layers together with the sugar and boiled water and leave them to rest for a few hours until the sugar melts. A lot of water will come out from the fruit. Put them back on the heat, add the chestnuts, the geranium leaves or vanilla, the cinnamon stick and lemon peel and when they begin boiling, reduce heat to medium and simmer until the syrup has thickened. When it is ready mix in the lemon juice. Remove from heat and when it is completely cold then store it in clean sterilized jars. This and many more recipes are included in my cookbook Mint, Cinnamon & Blossom Water, Flavours of Cyprus, Kopiaste! these are really some beauties. lovely! And Wonderful pictures! Ivy, let the quince recipes roll! If I can find some more here, I’ll continue to explore with them in the kitchen. Your glika koutaliou are always wonderful and I think you should try and sell some. Peter, unfortunately they don’t last long. I’m not sure if I’ll find any now. Sell them!! Okay I have a few jars left. Delicious as always Ivy. Kidonia are a favourite and this is a fantastic way to enjoy them. “Yia sta heria stas”. I wonder if you could start a home business like Peter suggests and sell jams and spoon sweets. If you made this 3 times it must be excellent!! Oh, how delicious! A heavenly combination! I love chestnuts but have never eaten a quince! Which is unfortunate for me because this looks really fantastic! I will have to keep an eye out for them, they are not real popular here. Lovely! n wonderful looking pics. Awwwww….!! This is torture, Ivy! My mouth is watering, and I want to take in those flavors and some of those fruits – all I can do is drool. Blogs have introduced me to many fruits we do not find in our Country, and quince is one such, chestnut is another! Though I haven’t had it I am already missing the taste:) Thank you for sending this delectable concoction of quince and chestnuts to FIC. This is my favourit Glyko when in Cyprus. I never knew for years what it was because my neighbours did not know the english for it.. gorgeous. I am going to have to make some now..